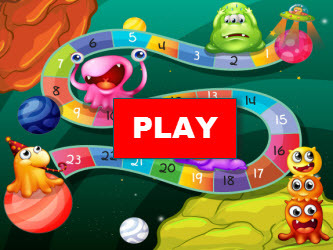 Play this fun multiplication board game and be the first one to get to the finish line. For each correct answer, you will be able to roll the die and advance on the board game. Can you get there before your friends? This game could be played in pairs, alone, or in two teams. Teachers, bring some spark into your classrooms and let your students engage in healthy competition, while sharpening their multiplication and reasoning skills. The game can be played on computers, smart boards, iPads, and other tablets. You do not need to install an app to play this game on the iPad. CCSS.5.NBT.1 Recognize that in a multi-digit number, a digit in one place represents 10 times as much as it represents in the place to its right and 1/10 of what it represents in the place to its left. CCSS.5.NBT.2 Explain patterns in the number of zeros of the product when multiplying a number by powers of 10. Use whole-number exponents to denote powers of 10. To play other exciting classroom math games, please visit this link. Return from the Multiplication Board Game to the 5th Grade Math Games webpage, or to Math Play.